In Nederland, I’m told, they’ll take any excuse to throw a party. Just a look at the place and you can believe it. It’s an eccentric little mountain-town, part ski-resort, part hippy with more coffee-shops per square mile than an Italian piazza, a hint of old-town pioneer and a good many folks that could easily knock-back to the 60’s. And, the party grooves like it too, baby. The frozen guy really just illustrates the point. 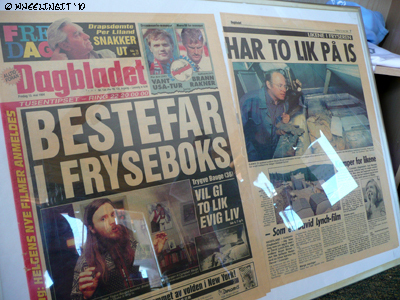 Nederland became famous, or infamous if you will in the early 90’s from an icy story that started in Romstel, Norway. It was all quite simple really. Bredo Morstoel wanted to live forever so when he kicked the bucket in 1989 his family diligently froze him. He then took a few side-trips and eventually landed in a backyard shed in Nederland, CO where the family kept him on ice in readiness for the time when modern medicine could revive him. All was fine and dandy until the local authorities found out, at which time sensational hell broke loose sending local newspapers, lawyers and the Norwegian press into a frenzy. But Nederland is not like other places you see. The locals loved the eccentricity of it all and decided the best possible thing to do was throw a party. After all, the man deserved a few beers for his efforts to attain perpetual existence. The party grew and eventually became a firm tradition, the “Frozen Dead Guy Days Festival” held annually in March. It’s just one of the many social events in Nederland. The town also hosts bands, open-air music and as many other festivities as they can cram into the 1.6 sq.mile area. Yes, it’s the perfect martini-mix of mountains, nature and a good ‘ol time. A weird enough place that I feel quite at home, and I’ll happily Skål to that. Great story! Keep them comin’! I saw this on the news or something. What a hoot. I have got to see that town. I love this place…definitely worth a visit!